Click the list view in which you want to set sorting options. Click the Sort and Group tab. Click the column field to which you want to apply a sort. To sort all list items in ascending or descending order, check Sort these values, and then select the sort order you want. To set a secondary sort order, check Then sort by, click a field in the drop-down menu, and then select the sort order you want. To force all items to be sorted into a flat view without hierarchies, check List all items, including Response items, in a flat view without hierarchies. This sort type is useful in cases in which you simply want to show all items in ascending or descending order, and ignore parent/child relationships among items. To group items with the same value, check Group items with the same value into an expandable section. Additionally, you can sort items within each group according to a secondary sort. In the example below, the "Food Group" field is checked as the primary sort in ascending order, and the "Item Type" is checked as the secondary sort in descending order. 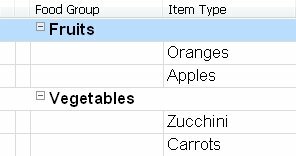 Additionally, "Food Group" field is set for grouping same values into an expandable section. Finally, the "Food Group" column is set to show a twisty: On the Columns tab, the option Show a twisty in this column when this row is expandable is checked. If you are grouping items according to a Date/Time field, click the Group Dates By menu, and then click the time value you want. If you want the view to open with the currently selected sort options check Make this the default sort when the view is first opened.